When you are constantly searching for a reason to bake & decorate a cake like I am, every once and a while you need to just invest in making a cake for no reason at all. The pay off is that you get to practice and mess around with a new design with no deadline or pressure. You can take complete creative license and just whistle while you work. (Not that I don't get to be creative and enjoy what I'm doing when I'm making a cake for a real event, it's just a different state of mind.) The other pay off is that you get to make your cake and eat it too. I didn't know where I was going with this cake when I made it. 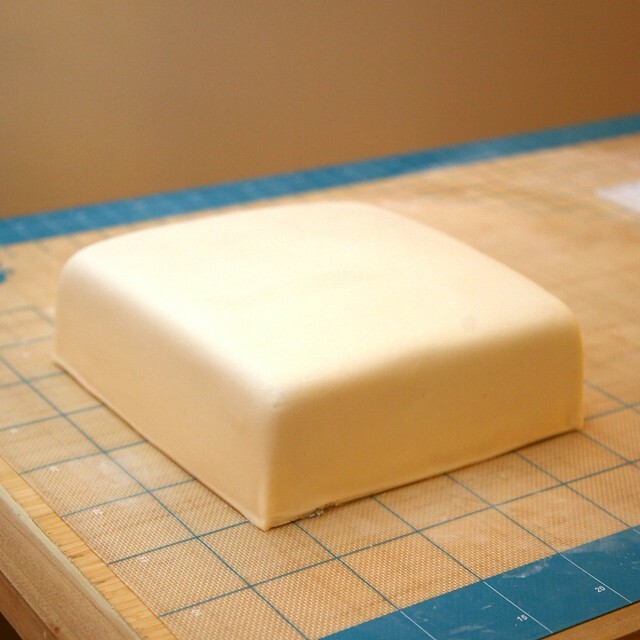 I wanted to get some practice icing a square cake and covering it with fondant. I did pretty well. I actually found it almost easier than a round cake. 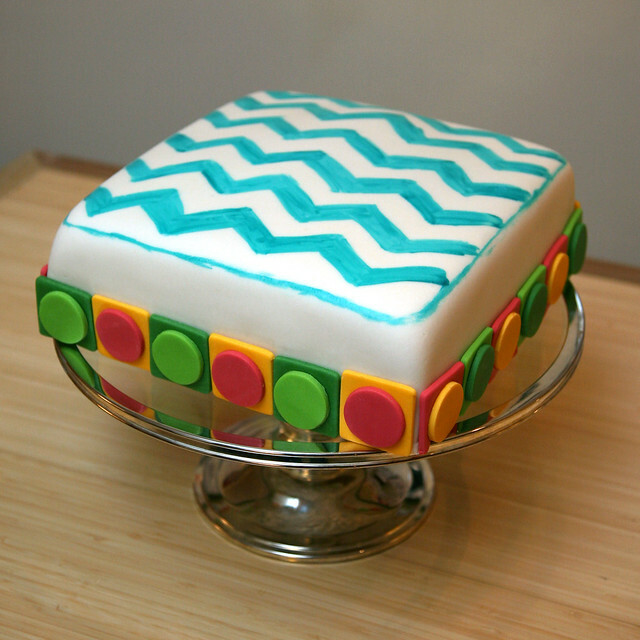 When it came time to decorate, I wanted to do something colorful and use some geometric shapes to create a pattern. 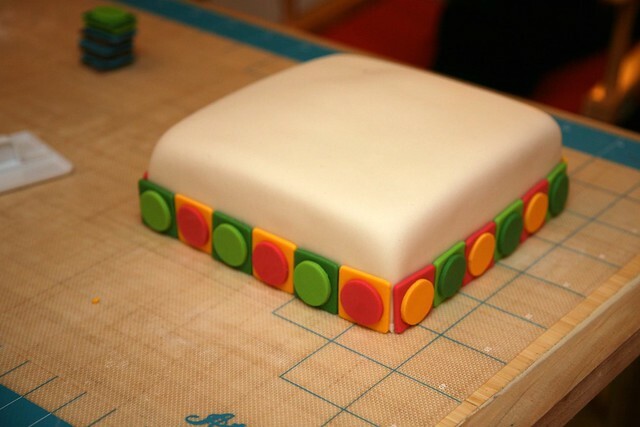 I started with circle and square fondant cut-outs and combined them to make a circle-within-a-square and placed them around the border. It kind of reminded me of tiles that were somewhat retro and somewhat modern. Maybe Pop. Retro Mod Pop. Modtrop? I think I'll just go with Mod. 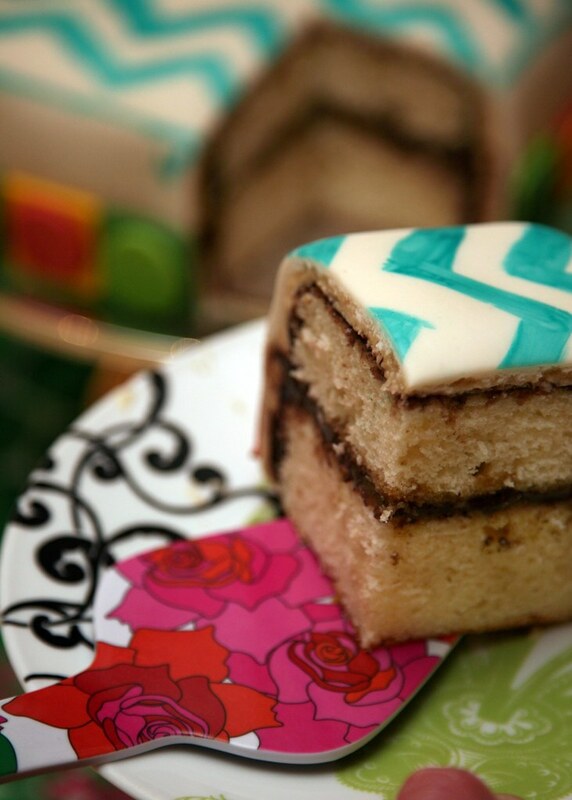 In the spirit of tiles, I decided to then paint the top of the cake with a loosely drawn herringbone pattern, also know as a chevron stripe or zig zags. 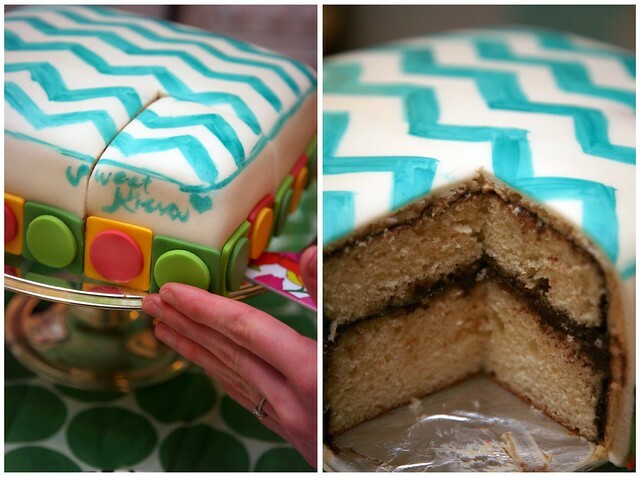 The lime, kelly green, carmine pink, and golden-yellow colors on the sides of the cake needed another color to tie it all together. Aqua blue seemed to do the trick. Inside this colorful cake lived a tasty cake. One you might remember from the Wind in the Willows Cake: White Cake + Caramel + Chocolate Frosting + Salted Caramel Buttercream. We had the cake the night Cole came home from a trip to Vegas for Jim's Bachelor Party. Mark and Vale were just getting in from a party while their kids slept over at their grandparent's house. Perhaps the cake found it's celebration after all. It became the After-Party Cake, which everyone knows is still a party. Madie rolled on over Sunday afternoon and had some After-After Party Cake. The life of the cake partied on with Cole's dad, Jim, who was coming back from a wild night of babysitting Lucy and Oscar. He heard a rumor from Vale that he might be able to catch some of the tail end of the Party Cake next door. Our neighbor, Izzie, popped-in late Sunday afternoon not knowing she'd be sent home with some cake for her and Lachie. I hear they ate their cake before dinner. Those Aussies sure know how to After-After-After Party. "You comin' to the after-after party?"